To be pierced in a scrupulously hygienic, open environment, by a clean, conscientious piercer, wearing a sterile pair of medical gloves. To a sober, friendly, calm and knowledgeable piercer, who will guide them through their piercing experience with confidence and assurance. To the peace of mind which comes from knowing that their piercer knows and practices the very highest standards of sterilization and hygiene. To be pierced with a brand-new, sterilized needle which is immediately disposed of in a bio hazard sharps container after use. To be touched only with freshly sterilized, appropriate instruments, properly used and disposed of or sterilized in an autoclave prior to use on anyone else. 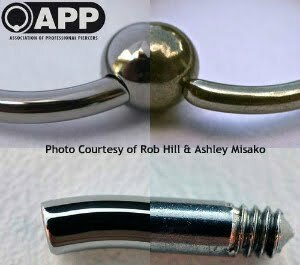 To know that ear piercing guns are NEVER appropriate, and are often dangerous, when used on any body part, including ear lobes. To be only fitted with jewellery which is appropriately sized, safe in material design and construction, and which best promotes healing. 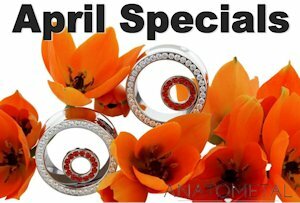 Gold-plated, gold-filled, and sterling silver jewellery are NEVER appropriate for any new or unhealed piercing. 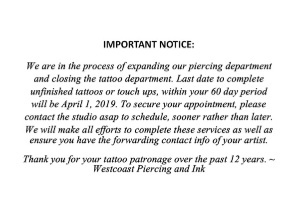 To be fully informed about proper aftercare, and to have continuing access to their piercer for consultation and assistance with all their piercing-related questions.